To Norvik on the "Ships starting with N" page. Built in 1938 by Deutsche Werft AG, Betrieb Finkenwärder, Hamburg. Owned by Tanker Corp., Panama, a subsidiary of Viking Tanker Co. Ltd., London, associated with Johan Rasmussen & Co.
Captain: Knut O. Bringedal (see also O. A. Knudsen). Errors may exist, and as can be seen, there are several gaps in her voyages. Unfortunately, since this was a Panamanian ship (and not included in Nortraship's register), records from the National Archives of Norway are not available for comparison with A. Hague's entries and, therefore, accuracy cannot be confirmed. 1941 Febr. 26 Milford Haven   OB 291 For Philadelphia. Oct. 7 Milford Haven   ON 24 For Curacao. See also HX 159 and narrative below. Dec. 6 Milford Haven   ON 44 For Curacao. Febr. 26 Liverpool   ON 71 For Aruba. May 22 Liverpool Halifax* June 5 ON 97 For Houston. There's a ship listed as the Norwegian Narvik in Convoy BX 28B, which originated in Boston on July 10-1942 and arrived Halifax July 12 (external link) - this should probably be Norvik (Narvik had not been delivered yet). July 25 Liverpool(?)   ON 116 For Trinidad. Dispersed off Boston, Aug. 12. Aug. 19 Halifax Trinidad* Aug. 28 HA 4 For Trinidad. Aug. 29 Curacao Trinidad Aug. 31 WAT 16 Curacao to Trinidad. Dec. 28 Trinidad   TM 1 Sunk - See "Final Fate below. For information on voyages made in between those mentioned here, please see Hague's Voyage Record above. Follow the convoy links provided for further details; several Norwegian ships took part. 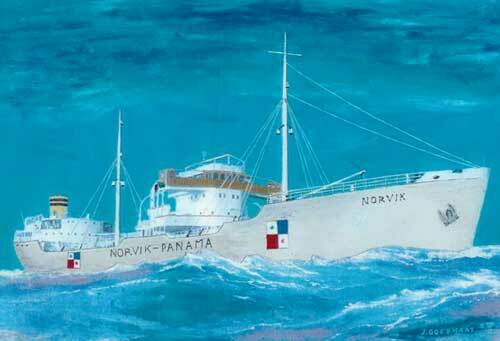 Norvik is listed in Convoy SL 60 from Freetown in Dec.-1940, bound for Swansea Bay with crude oil. This convoy left Freetown on Dec. 22 and arrived Liverpool Jan. 13-1941. She's also listed, with destination Philadelphia, in Convoy OB 291, which originated in Liverpool on Febr. 27-1941 and dispersed March 3. This convoy also had some Norwegian ships, namely Caledonia, Grena, Hardanger, Hilda Knudsen, Laurits Swenson, Skaraas and Storaas. Follow the links provided in the Voyage Record for more information on these convoys. In Sept.-1941 she was in Convoy HX 149 from Halifax to the U.K., along with the Norwegian Aristophanes, Brasil, Daghild, Thorsholm, Innerøy, Thorshov, Somerville, Glittre, Lise, Harpefjell, Brant County, Kollbjørg and others. The following month she's listed as bound for Curacao in the westbound North Atlantic Convoy ON 24*, which originated in Liverpool on Oct. 8 and dispersed on the 15th, and included the Norwegian Abraham Lincoln, Aristophanes, Brasil, Glittre, Grey County, Herbrand, Idefjord, Innerøy, Petter, Solfonn, Thorshavet, Thorshov and Topdalsfjord. Norvik's arrival Curacao is not known. In Nov.-1941, we find her named among the ships in Convoy HX 159, but please note that I can't be 100% sure this listing is correct. A. Hague has not included her in this convoy, but on the other hand it does match up with the fact that he has listed her in a BB convoy from Belfast Lough to Swansea around the time HX 159 arrived the U.K., so it's possibly she had stopped at Belfast Lough on her way from Halifax. With Anna Knudsen, Belinda, Garonne, Montevideo and Toledo, she later joined the westbound Convoy ON 44*, which started out in Liverpool on Dec. 7 and dispersed Dec. 15. Montbretia and Rose are named among the escorts (see ON convoy escorts). Her destination is again given as Curacao, but again, her arrival there is not known. In Jan.-1942 she can be found in Convoy HX 172 from Halifax, later joining Convoy ON 71*, departing Liverpool on Febr. 26, dispersed March 8. Athos, Fagerfjell, Fjordaas, Gallia, Garonne, Høegh Giant, John Bakke, Malmanger, Skaraas, Solfonn and Velma are also listed. This time Norvik's destination is given as Aruba. She headed back to the U.K. again early in May in Convoy HX 188, subsequently joining the westbound Convoy ON 97*, along with B.P. Newton, Brant County, Brimanger, Cetus, Gallia, Norfjell and Nortind. ON 97 left Liverpool on May 22 and arrived Halifax June 5; Norvik, however, was bound for Houston on that occasion. In July that year A. Hague has included her in Convoy HX 198 from Halifax, and with Bollsta, Bur, Cetus, Ledaal, Snar and Vanja, she now joined the westbound Convoy ON 116*, departing Liverpool on July 25, dispersed on Aug. 12; Norvik's destination was Trinidad where she, according to A. Hague, arrived (via Curacao) on Aug. 31. * The ON convoys will be added to individual pages in my Convoys section in due course, along with further details on each. In the meantime, the ships sailing in them (and escorts) are named in the section listing ships in all ON convoys. For more details on the Norwegian ships mentioned here, please see the alphabet index below, or go to the Master Ship Index. Norvik was torpedoed on Jan. 9-1943 by U-522* (Schneider), and sunk 28 08N 28 20W, 2 died, 43 survived; crew list is not available. At the time, she was in Convoy TM 1, which had left Trinidad on Dec. 28 and had Gibraltar as its final destination, but only 2 ships made it that far on Jan. 14. For more information, please follow the link to Convoy TM 1 - see also my accounts for M/T Minister Wedel, M/T Albert L. Ellsworth and M/T Vanja, as well as the 2nd external link below. * "Nortraships flåte" gives U-575 (Heydemann) as the attacker of Minister Wedel and Norvik. J. Rohwer says: "U-522 reported three hits, which were also observed by U-575. It is probable that two hit Minister Wedel, which started to burn fiercely, and the other the Norvik. HMS Havelock unsuccessfully tried to sink both ships by gunfire. The two vessels were sunk the next day by torpedoes from U-522" - (same position). He also gives the tonnage 10 034 gt for Norvik, as does "Lloyd's War Losses, Vol. I" and Charles Hocking, who adds she was on a voyage Trinidad-Gibraltar with 13000 tons of fuel oil. He gives the position as about 500 miles west of Teneriffe. Stavern Memorial commemoration - Pumpman Jan Jens Johansen is commemorated. Back to Norvik on the "Ships starting with N" page. The text on this page was compiled with the help of: Misc. sources, including J. W. Jordan's "The World's Merchant Fleets 1939" and those mentioned within my text above (ref. My sources).